EA Sports Unveils Launch Day DLC Program "Online Pass"
EA Sports has jumped on the day-one DLC bandwagon with Online Pass, which offers bonus features and content to gamers who buy brand-new copies of EA Sports games. EA calls it "Project Ten Dollar": Single-use codes for bonus game content that comes free with new copies of games but must be purchased separately by anyone who buys used. Both Dragon Age: Origins and Mass Effect 2 made use of it and in March, EA Sports President Peter Moore said he was a fan of the system too. It's no surprise, then, that EA Sports will soon begin offering extra content to its customers through a similar system called Online Pass. One single-use Online Pass code, offering "online services, features and bonus content," will be included free with each new EA Sports game, while additional Online Passes can be purchased once the freebie is redeemed for $10 each. "This is an important inflection point in our business because it allows us to accelerate our commitment to enhance premium online services to the entire robust EA Sports online community," Moore said. GameStop, whose pre-owned game sales are a big reason why Project Ten Dollar exists in the first place, appears to be trying to get out in front of this one by selling "point cards" with new and used copies of EA games that can be used to purchase Online Pass content. "We're delighted that GameStop is offering their support of this program as a place for gamers to purchase points that provide access to downloadable content from EA at their stores and through their website," Moore added. Online Pass will debut with Tiger Woods PGA Tour 11, coming out on June 8 for the Xbox 360, PlayStation 3 and Nintendo Wii. 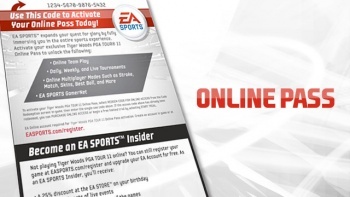 For more information, have a look at the Online Pass page at EASports.com.